Learning the gender of their unborn twins, what to name them and how to plan for upcoming changes in their lives are just a few of the relatable challenges. But unlike most couples, Ferre, 23, and Castro, 30, must figure out their future while living 3,000 miles apart and with no clear sense of when they’ll be together again. Ferre, who lives in Mona, Utah, and Castro, who is in gang-plagued El Salvador, are divided by an overwhelmed immigration system that has put their lives on hold. For more than a year, Castro’s been waiting to join his family in the U.S. Their hopes hinge on his receiving an immigrant visa, the first step toward getting a green card and eventually U.S. citizenship. “We are always praying and asking God to help us,” Castro said in a video call from El Salvador. 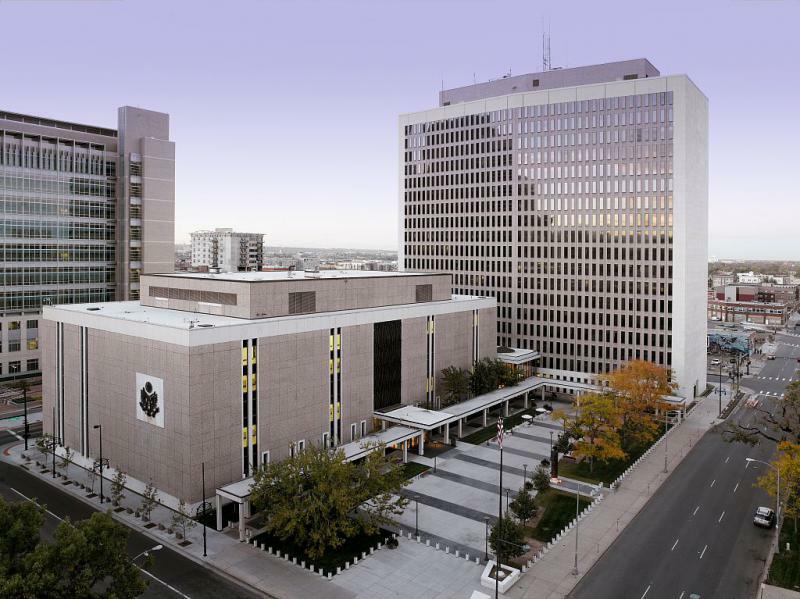 A report released in July by the National Partnership for New American Citizen found that Utah had the largest increase of pending citizenship applications between 2016 and 2017. But the line for immigration services is long. With their babies on the way, the couple’s urgency to get Castro legal residency has increased, adding stress to what should be a happy, yet already anxiety-inducing milestone in their lives. It’s a frustration that a growing number of would-be immigrants and citizens in Utah and around the country are facing. As the Trump administration continues to crack down on immigration — legal or otherwise — a backlog of immigration-related applications is also increasing. Nearly 1 million people applied to be U.S. citizens last year, the highest number in a decade, according to the Department of Homeland Security In some cases what normally takes six months is dragging on for two years, The Associated Press reported last month. Utah had the largest increase of pending citizenship applications between 2016 and 2017, according to a report released in July by the National Partnership for New American, a coalition of immigrant rights groups. 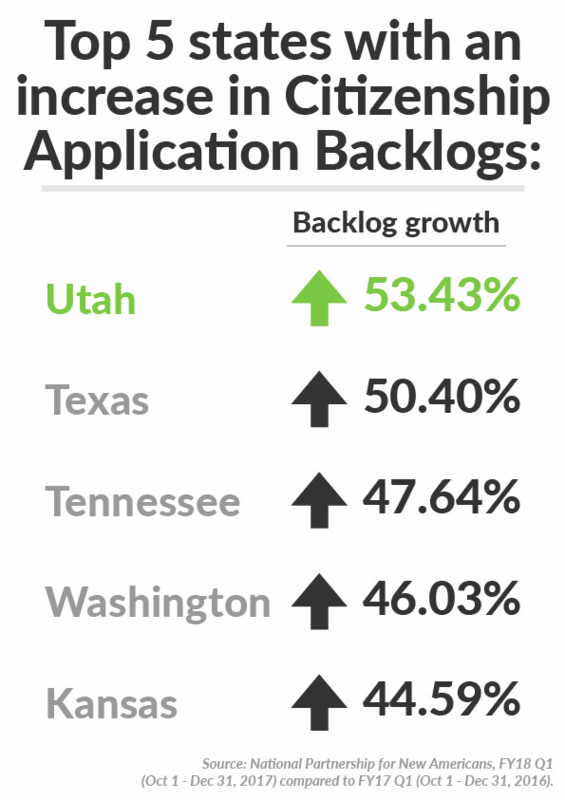 At the same time, Utah was among a handful of states that had a large spike in denied applications. For those like Castro who are near the back of the line, family-based green card applications rose by 34 percent during the same time period, according to US Citizenship and Immigration Services, an agency of the Homeland Security Department. The agency received almost 366,000 family-based green card applications during its last fiscal year, a spokeswoman said. 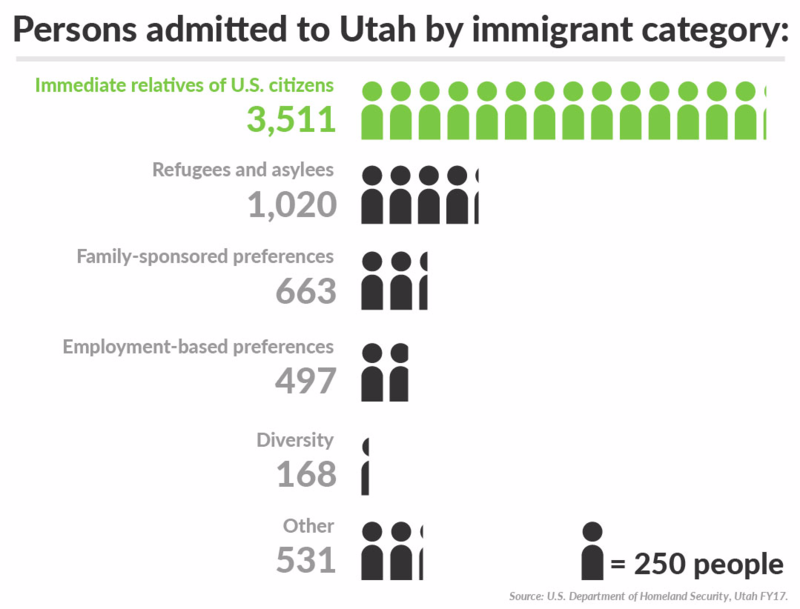 Data from the U.S. Department of Homeland Security shows that the majority of legal immigrants in Utah are immediate relatives of U.S. citizens. The Trump administration has signaled its determination to end what immigration restrictionists call “chain migration,” a term used to describe family-sponsored migration. That doesn’t apply to married couples like Ferre and Castro. Regardless, the system remains clogged. In response to the surge, the immigration agency expanded its field offices and open new offices with the surge of applications. It has also hired more officers in response to the surge. But Ur Jaddou, a former chief counsel for U.S. Citizenship and Immigration Services, said that the Trump administration’s tougher immigration policies has also contributed to the backlog. “It is this agency’s job to process those applications in a fair amount of time. And if they are not doing their best to manage that, then they are not doing their job,” Jaddou said. She blames the Trump administration for rolling out new policies without sufficiently preparing immigration officers for the changes. “When something is new, it does create a little bit of a backlog but if you properly prepare, you can mitigate most of the issues and certainly this administration has no track record of that,” Jaddou said. 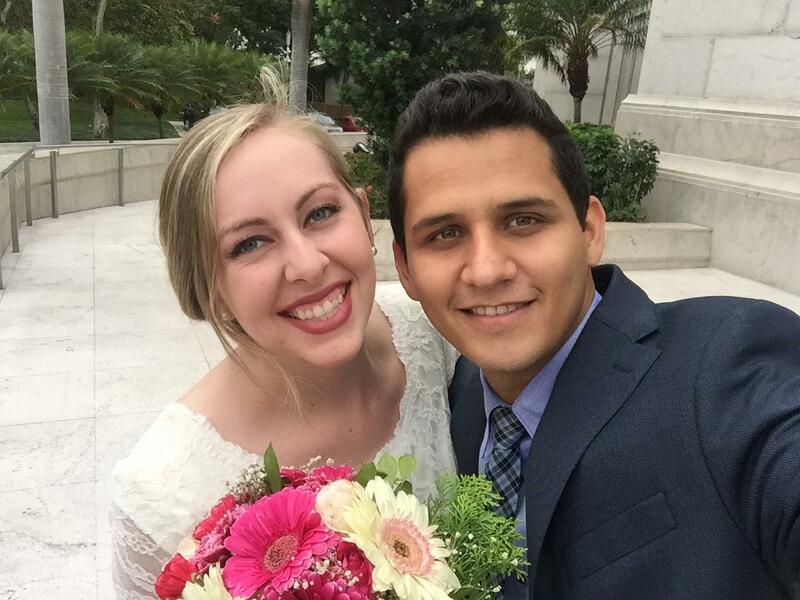 The couple met more than three years ago while Ferre was serving on her mission for the Church of Jesus Christ of Latter-day Saints in the Central American country. After her mission was over, they stayed in contact and grew closer. They started a long-distance relationship, but pretty soon it was clear to both of them that they wanted something more. The plan was to get married and live together in El Salvador until Castro could obtain a green card, but then trouble returned to Castro’s life six months before they supposed to be married. Before meeting Ferre, Castro was extorted by a gang. The gang targeted him again before the couple’s wedding last March. Castro fled north to the U.S. border with Mexico. But Border Patrol agents caught him in South Texas after he snuck into the country by rafting across the Rio Grande in October 2016. It’s a decision Castro said he now regrets. “I didn’t know what to do and suddenly, in a stupid move, I went illegally to the United States in part because I was afraid, and in part out of desperation because I didn’t know what to do,” Castro said. He immediately asked for asylum but he was denied. Two months later, he was deported back to El Salvador and banned from re-entering the United States for five years. Kenadee Ferre and her husband Eleazar Ishmael Castro Afane after their March 2017 wedding. Undeterred, they married in March 2017. But then Ferre was accepted into a Draper nursing school and decided it would be best to return home to study while they wait for Castro’s application to be approved. She visited El Salvador during school breaks, but now that she’s pregnant and finances are tight she’s not sure when she’ll see her husband again. The distance has been challenging for their marriage, Castro said. “Sometimes I feel powerless knowing that I can’t do anything and I want to do something to see Kenadee happy or be there with her so she can relax,” he said. Determined to be together sooner yet committed to reuniting legally, hey submitted an immigrant petition to the immigration agency last October. Just last week they took one step closer when the agency approved their immigrant petition with some help from Rep. Mia Love’s office, which asked the agency to expedite the case given Ferre’s pregnancy. Kenadee Ferre is expecting twins with her husband Eleazar Ishmael Castro Afane who is waiting for an interview at the U.S. consulate in San Salvador for an immigrant visa. Here, Ferre's sister runs an ultrasound. The next step for Castro will be an interview at the U.S. consulate in San Salvador, the capital of El Salvador, to get an immigrant visa. In the best case scenario, Castro will have an interview with the consulate by next spring. But with the complication of his deportation, they’ll also need to get a special waiver to allow his application to proceed. There’s no telling how long that could take, their immigration attorney, Isabel Cuevas, said. For now, Ferre is living with her parents in Mona, Utah. She has baby girl and boy clothes in case they are fraternal twins like her grandma and her grandma’s brother. She said she dreams about a day when she and Castro will be able to buy their own home and living with their children under a single roof. As President Donald Trump pushes to end birthright citizenship for U.S.-born children of immigrants who are not citizens, a federal court case filed in Utah that seeks to expand that exact right for American Samoans is heating up.